IN THE INTEREST OF FULL DISCLOSURE: As many of you may know, I have been involved with North Korea n human rights issues with an organization called HanVoice (www.hanvoice.ca), which I helped found in 2007. 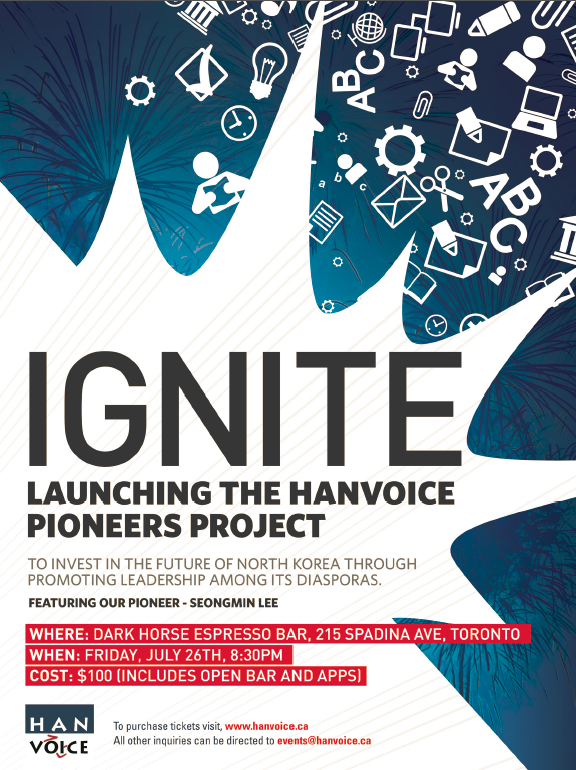 Since then, HanVoice has grown into the largest non-profit in Canada dedicated to North Korean human rights issues. When it comes to North Korean refugees, one of the key areas of need that we have identified is leadership. This is especially true for the North Korean community in South Korea, where most of these refugees ultimately settle. Despite more than a fifteen year presence within South Korea, very few North Koreans have emerged as leaders of their own community. With a first-of-its-kind program designed to address these challenges, HanVoice is pleased to announce the launch of the HanVoice Pioneers Project. Inviting a bright future leader to Canada, this program is designed to impart upon this candidate the tools necessary to speak on behalf of the North Korean refugee community worldwide. This will include not only learning English, but taking advocacy classes and “walking the halls of power” by interning at a Member of Parliament’s office. As part of this launch, I would like to invite you personally to meet our first candidate, Seongmin Lee on Friday, July 26 starting at 8:30 pm at the Dark Horse Espresso Bar at 215 Spadina Avenue, Toronto. Tickets are $100, and an open bar and appetizers will be provided. Having had the chance to meet Seongmin, I must say that I am impressed with everything that he has been able to achieve since escaping North Korea only three years ago, including interviews with the Economist, an article published with CNN, and being the first North Korean to speak at the UN Human Rights Council. I hope that you will be able to join me in welcoming Seongmin to Canada. Thank you for bearing with me so far. Please let me know if you have any questions – and hope to see you on Friday, July 26!